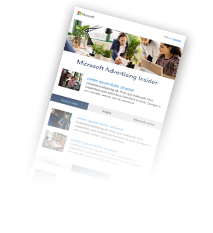 Last year, we announced the availability of the Market Sizing Dashboard, located on the Bing Ads Agency Hub. At the time, it was a simple Excel spreadsheet with some charts showing Bing Ads data delivered at the DMA (Designated Market Areas) level. This year, we've redesigned everything and created a visual interface, allowing you to identify hotspots by any state or DMA. If you're the type of advertiser who's dependent on local targeting to quickly identify opportunities at a granular level, this tool will help you do exactly that. Navigation is very easy, but for anyone who wants to go deeper, all data -- which is available for the previous 6 months and will be refreshed on a monthly basis -- can be exported and customized. Let's say you work for a digital advertising agency that manages multiple car dealerships on the west coast. 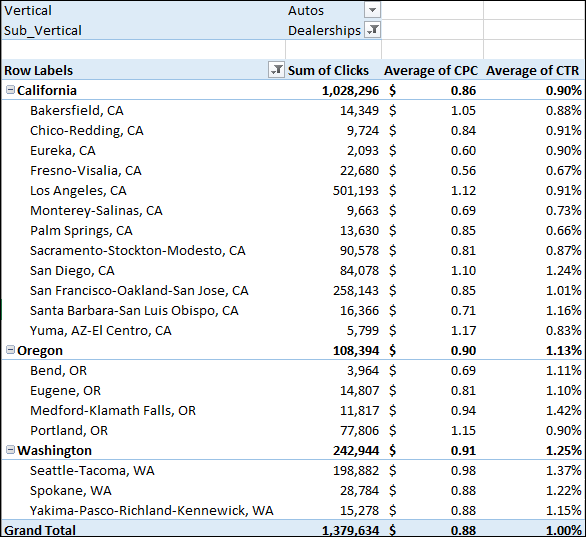 You want to know how click volume compares in California, Oregon and Washington and its specific DMAs. Once logged in to the Market Sizing Dashboard, you’ll follow the steps below to get the insights you need. From the menu dropdowns located at the top of the page, simply select the vertical and sub-vertical you’re interested in, select a device type (PC/tablet, Mobile or All), then choose the month (or All) for the results you need. From the KPI menu, choose either impressions, clicks, CTR or CPC. Once those selections are completed, click on the “Get Heatmap” button. 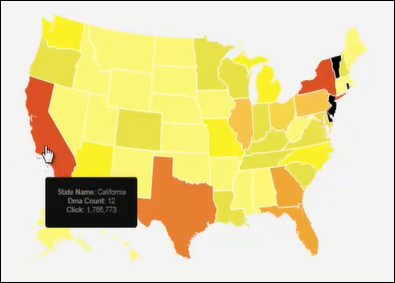 While the map reveals California and New York as the states with the most clicks, the table on the left additionally shows the top ten states in a data grid. The data set also includes population percentage resulting in an index number; the higher the index number, the more clicks proportionally are coming from this state. You’ll notice that searches for dealerships on Bing and Yahoo seem to perform very well in Arizona and Georgia. When hovering over a state, you can also see the number of DMAs within and a quick data summary. This important feature can help with location and radius targeting. Once a state is selected, you will then see the details for each DMA within. By clicking on any given DMA you’ll get a chart showing the trend view for the past six months. Note: DMAs across all charts are based on Nielsen Net Ratings’ total population data, so some DMAs may include multiple cities, e.g. Dallas/Fort Worth or San Francisco/Oakland/San Jose. All other data are based on internal Bing Ads reporting based on geo-location of users. You can change your menu settings at any time and refresh the map and data by clicking on the "Run" button located in the upper right corner. The green button with the downward facing arrow allows you to export all data for the entire vertical as an Excel file. From here, it’s easy to build customized tables and pivots. Getting back to the example of auto dealerships, you can now compare click volume, CTR and CPC for each DMA in one simple view and align your budget and bids accordingly. If there are still questions, please refer to the Help section located in the lower left of the dashboard and watch the short video tutorial, or send us an email at bingconnect@microsoft.com. I hope that by sharing these local insights we are able to help you further optimize your campaigns at a more granular level.